WisBar Advance Desktop replaces your existing Today screen. You can create shortcuts, system meters, floating windows and virtual pages to extend the functionality of your PocketPC.WisBar Advance Desktop also supports most existing Today plugins. You can arrange them on multiple pages in order to maximize their usefulness. 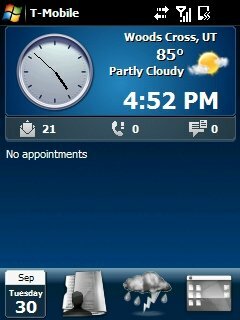 · Add widgets to your screen: Monthly calendar, Digital or analog clock, Images, Text to monitor the registry, Weather conditions, Grids for contacts, shortcuts or embedded objects, Display up to the next seven days of appointments, Status icons, Notifiers, and more! · Easily import themes created by other users and easily share your own creations!